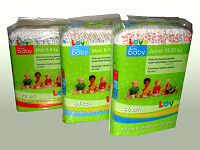 Two ply leg gathers, which are the second guard against diaper leakage. Acquisition layer option is available to speed up the time the absorbent core absorbs moisture. Silky soft cloth like interior lining that aids in absorption while being comfortable. Wet wipes are ideal for cleaning babies. They leave the babies skin clean and soft. Thick soft cloth-like sheets are used to insure strong yet comfortable performance. MEDcom can offer you all types of wet wipes and in all sizes of non-woven. Our wet wipes are alcohol and chlorine free and have been dermatological tested. We also carry PEG free wet wipes. We can offer private label wet wipes. Some of our private label customers are the biggest retailers in Europe. MEDcom can help your store earn more!! Our experience in manufacturing private label products has lead us to build up a partnership with the large retailers as well as the medium and small sized retailer in Europe. We are very flexible and work closely with you to make sure your private label product is a success.